Japanese beetles and masked chafer adults are attracted to moist soils and, apparently, to green grass to lay their eggs. In years when rainfall is abundant, nonirrigated (as well as irrigated) turf stays green and attractive to egg-laying female beetles. As a result, eggs are laid over all of these areas, resulting in fewer eggs laid per square foot. The resulting larvae are usually fewer than the 10 to 12 white grubs typically necessary to cause turf injury. In those areas of Illinois with an abundance of rainfall this year, such as in the northwestern part of the state, grub treatment may not be needed. In dry years, the beetles are strongly attracted to the moist soils and green grass of irrigated turf to lay their eggs, laying relatively few eggs in the dry, brown, unwatered turf areas. 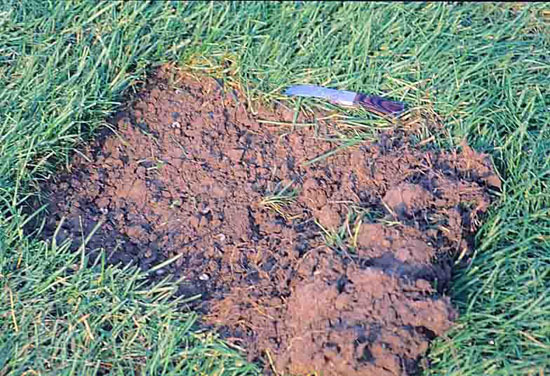 This results in high numbers of white grubs in watered turf, which cause damage in the form of wilted, brown turf that is easily pulled back due to the white grubs eating the roots. In much of Illinois, irregular rains have caused many areas of turf that are not irrigated to green up for a few days and then turn brown for a week or so until the next rain. These rains do not appear to be wetting the soil very deeply. As a result, the Japanese beetle and masked chafer adult beetles have likely laid considerably more eggs in irrigated turf. 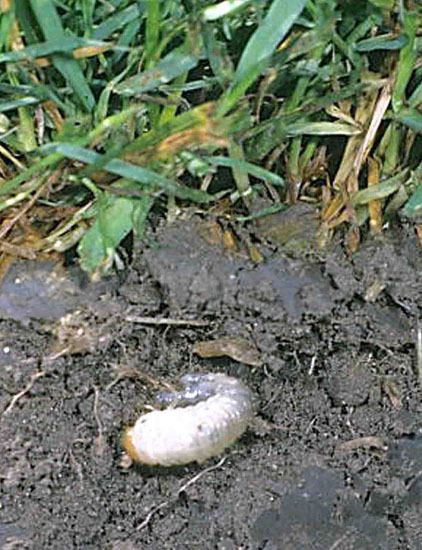 This sets up a situation in which damage is likely to become apparent in the second half of August and later, when the resulting white grubs grow large enough to cause serious turf damage. After the first week of August, most of the white grubs should have hatched, allowing scouting to determine for certain whether treatment is necessary. Scout for white grubs by cutting through the turf with a heavy knife. Pull the sod back to reveal the white grubs in the root zone. Check the soil hanging to the turf roots for white grubs, as well as the soil below the roots. Till the upper 2 to 3 inches of soil with your knife to check for white grubs in that region as well. If the soil is dry, till a couple of inches deeper to check for grubs that may have migrated down to moister soil.